In western Guinea, two ecoregions characterize some 300 km of Atlantic coastline and coastal plains — the Plaines Côtières (PC – Coastal Plains) and Zones de mangroves (ZM – Mangrove Zones). 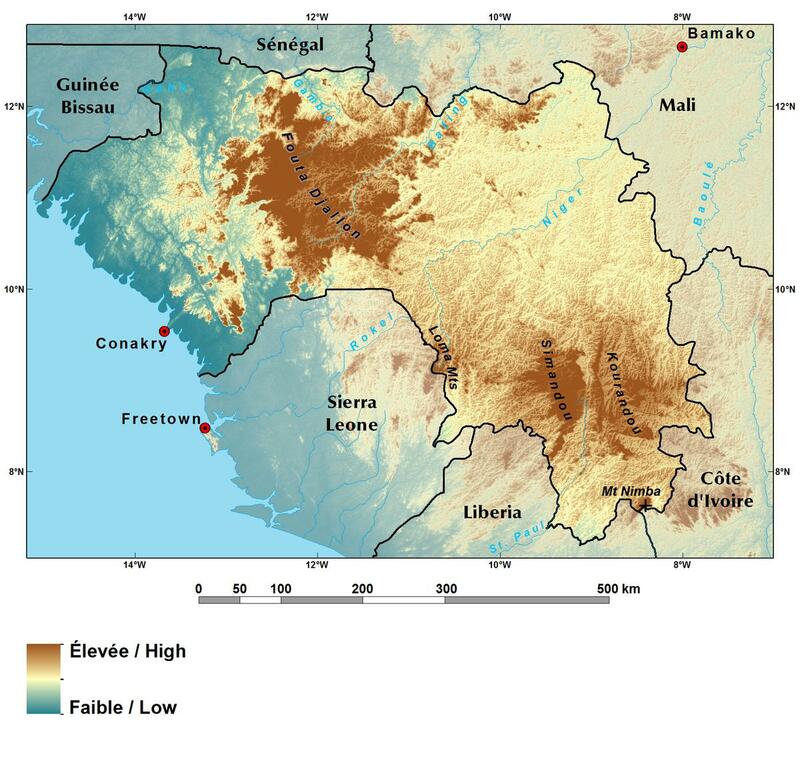 Eastward of the coastal lowlands the land rises, at times in the form of spectacular escarpments, into two major ecoregions, the Plateaux de Basse Guinée (PBG – Lower Guinea Plateaus) and the Zone de Savane et de Montagne (ZSM – Savanna and Mountain Zone). Guinea’s famous interior highlands are captured in two ecoregions, the scenic Massifs Montagneux du Fouta Djallon (MMFD – Mountainous Blocks of Fouta Djallon) and the Contrefort du Fouta Djallon (CFD – the Foothills of the Fouta Djallon). Both the MMFD and the CFD are made of rugged high plateaus, often capped by laterite (bowé), and dissected by deep valleys. Most of Guinea’s rivers originate here, fed by the abundant rainfall of the highlands. Descending to the east, the Niger River and its tributaries have fashioned the low, rolling landscapes of the Haut Bassin du Niger (HBN – Upper Niger Basin) with its broad plateaus and alluvial plains once covered by extensive savannas and gallery forests. This relatively dry part of Guinea falls into the Sudanian climate zone. 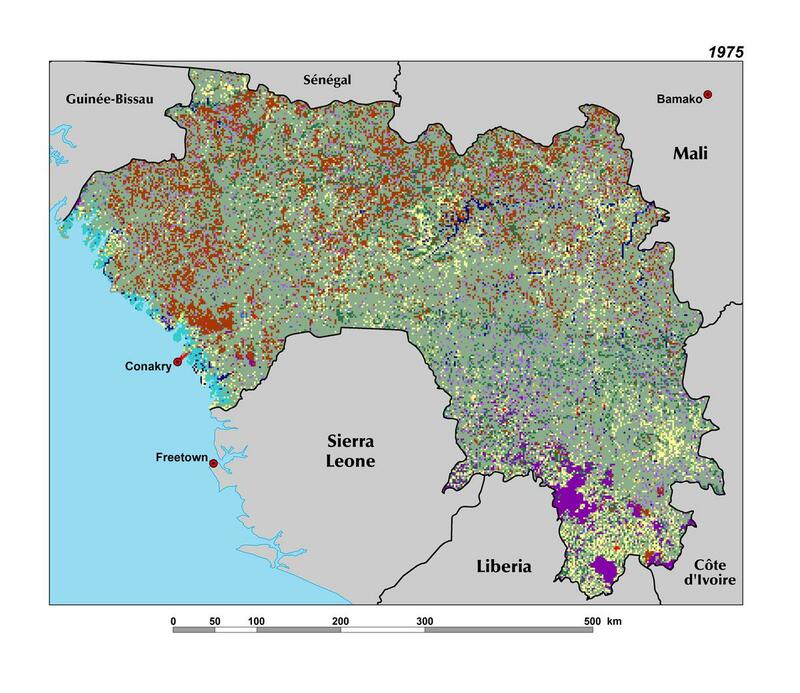 The south part of the country is home to Guinea’s forest zone (ZPF – Zone Pré-Forestière and PF – Zone Forestière), whose ecoregion names derive from the Upper Guinean forest that formerly covered large swaths of this region. The Zone Forestière is made of a ridge, which is a spur of the Fouta Djallon highland, extending as far south as Mount Nimba (1,752 m). The forest is now limited to the high valleys and eastern flanks of these mountainous zones (CM). Although prone to erosion on steeper slopes, the soils of the Zone Forestière are highly fertile, supporting cultivation of food and cash crops, such as coffee, tea, cocoa and rubber.